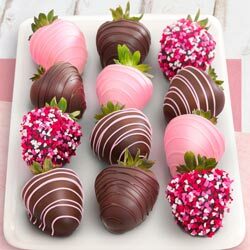 A Gift Inside and Golden State Fruit present our fruit and gourmet clubs that let you customize the perfect gift. 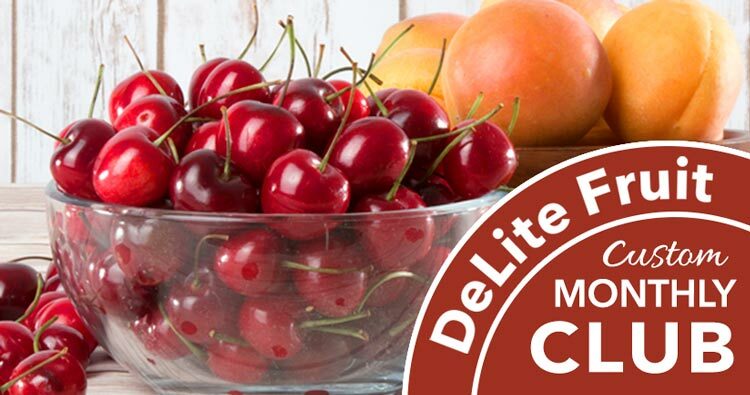 Choose the fruit of the month or gourmet selection and delivery months with free shipping every month. Many fruit options are direct from our orchards! Complete satisfaction is guaranteed. Need a last-minute gift? All club order confirmation emails include a Club Membership Certificate (PDF) with your gift's details and your personal message. Print it or attach to an email to announce your gift before the first delivery. The only “light-sized” fruit club available that gives you a choice of fruit for each month with several grown in our own orchards. Includes: Approx. 3 lb/mo. 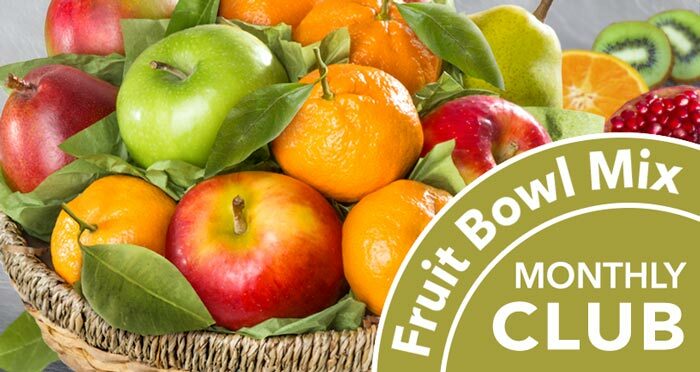 of fruit of the month, Club Membership Certificate with your personal message, Monthly Fruit Info. Customize: 2 monthly fruit options or a combination of both. Your choice of delivery months. Our larger-sized club offers more fruit per month with more choices. Includes: Approx. 4.5 lb/mo. of fruit of the month, Club Membership Certificate with your personal message, Monthly Fruit Info. Customize: Your choice of delivery months. Includes: Approx. 4.5 lb/mo. 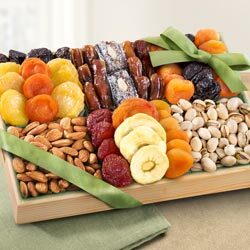 of assorted fruit, Club Membership Certificate with your personal message, Monthly Fruit Info. Customize: Choose all organic fruit or fruit with an organic snack. Your choice of delivery months. 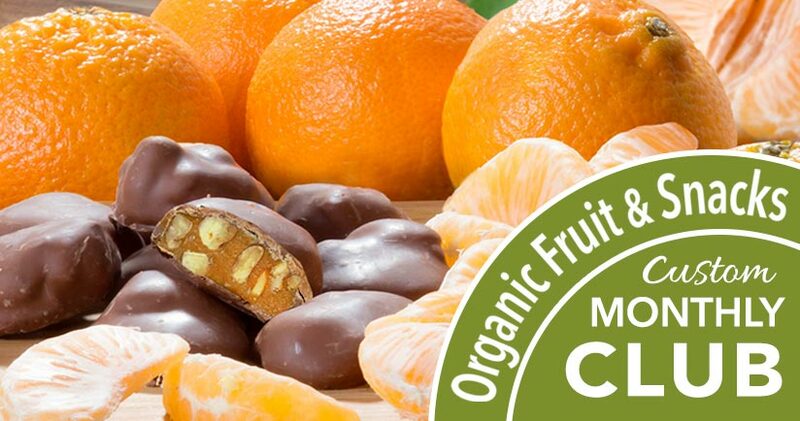 Our certified organic fruit club gives you the choice to send just the fruit or pair with an organic snack. Includes: Approx. 3-4 lb/mo. 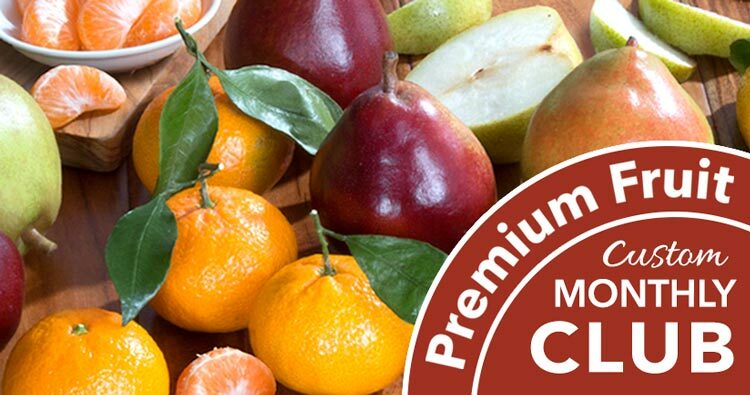 of organic fruit of the month, Club Membership Certificate with your personal message, Monthly Fruit Info. Customize: Premium fruit with your choice of one artisan cheese. Choose delivery months. Our light-sized fruit and cheese club gives you a choice of a premium artisan cheese that pairs perfectly with each monthly fruit option. Includes: Approx. 2.5 lb/mo. 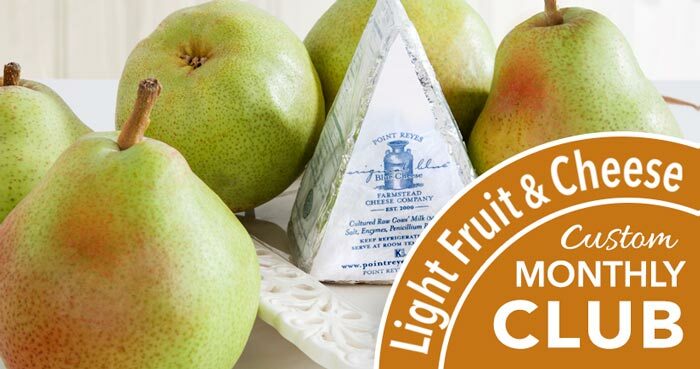 of fruit of the month with one piece of cheese, Club Membership Certificate with your personal message, Monthly Fruit Info. Customize: Premium fruit with choices of two artisan cheeses. Choose delivery months. 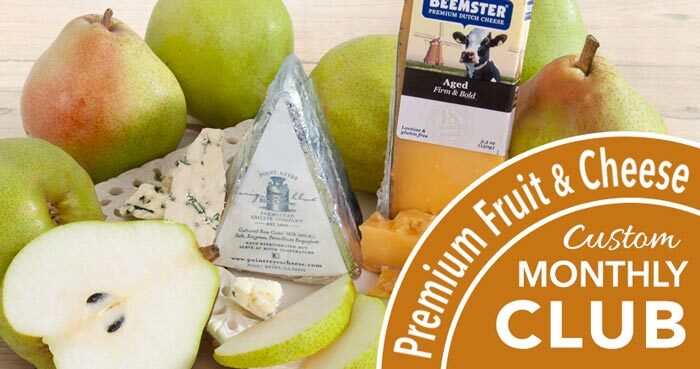 Our larger fruit and cheese club offers two premium artisan cheeses (2 pieces of a single cheese or one piece of each) that pair perfectly with each monthly fruit option. Includes: Approx. 4 lb/mo. 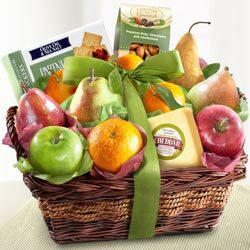 of fruit of the month with two pieces of cheese, Club Membership Certificate with your personal message, Monthly Fruit Info. 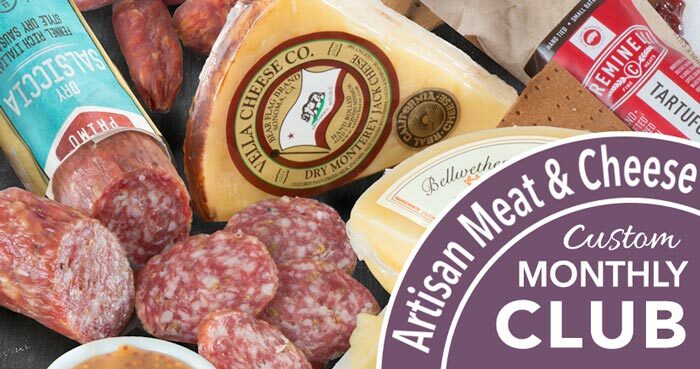 Meat and cheese lovers will rejoice with our carefully curated monthly selections. Includes: 3 pieces of cheeses and salamis per month., Club Membership Certificate with your personal message. Handcrafted real chocolate creations delivered monthly. All monthly confections are handmade in our CY Chocolates kitchens by our chocolate artisans. Includes: Approx. 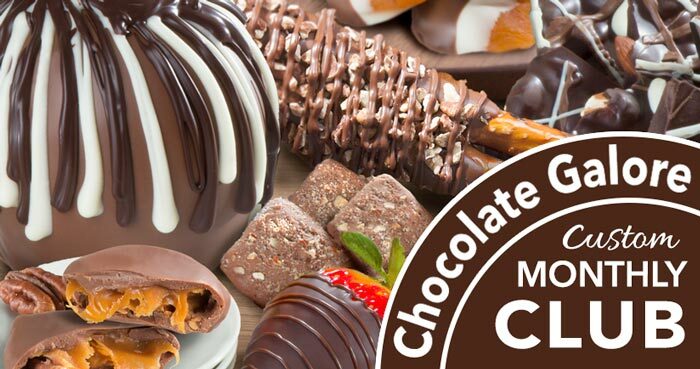 1.5 lbs Chocolate of the Month, Club Membership Certificate with your personal message.